When you think of carnivores, what animals come to mind? There are the standard lion, wolves, and bears but in the end, the most common meat eaters and hunters walk...er crawl...among us. That sweet little songbird sitting on a fence post in your backyard? It's a terror to the crickets who live under your porch. Yes, the bluebird singing on your shoulder is despised by the fireflies who light up the night. That might seem sad but it's one of the rules of that circle of life we've heard so much about. And what about ladybugs? They're why we're here, right? They're some of the most useful carnivores out there! These little hunters feast on the aphids that would love to feast on your tomato leaves. They're more than happy to protect your garden from getting attacked by the green munching bugs. Turns out the predators aren't always the bad guys! With high-waisted pants and trendy suspenders, you're sure to love this modern take on the classic ladybug! The red leggings have an over-sized polka dot pattern and just the right amount of stretch. The pullover crop top is layered under daisy suspenders that have sheer little wings attached to the back. The costume is topped off with pompom-topped antennas and heart-shaped glasses. It's a happy day when you find a ladybug strolling through your garden. The sighting means your precious veg is safe from pesky plant eater insects. 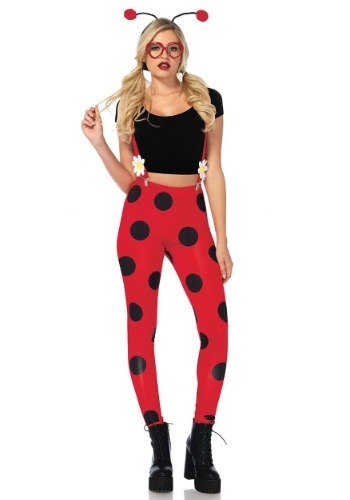 You can be sure you'll be just as welcome where ever you go when you're wearing this black and red ladybug costume. This outfit is perfect for summer parties as well as a cheery option for Halloween! Those aphids better watch out. You might be cute but you're still a carnivore.